Chocolate lovers rejoice! 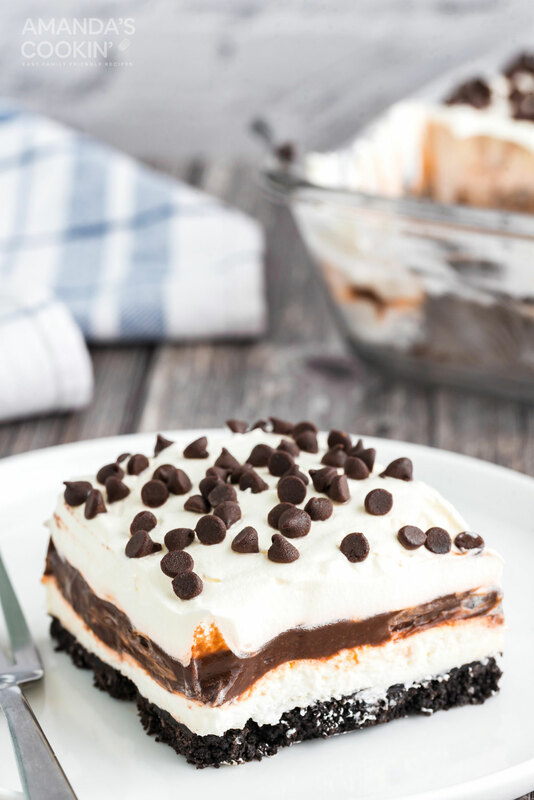 This no-bake Chocolate Lasagna is filled with cream cheese, chocolate pudding, and chocolate chips on top of an Oreo cookie crust! 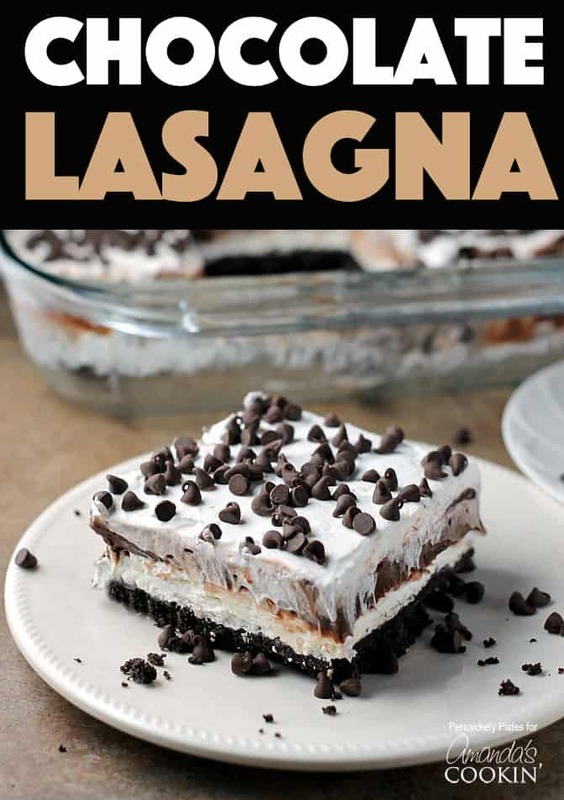 if you’ve never tried chocolate lasagna you are in for a delicious treat! And if you need something a little fancier for the holidays, try our Chocolate Lasagna Trifle! 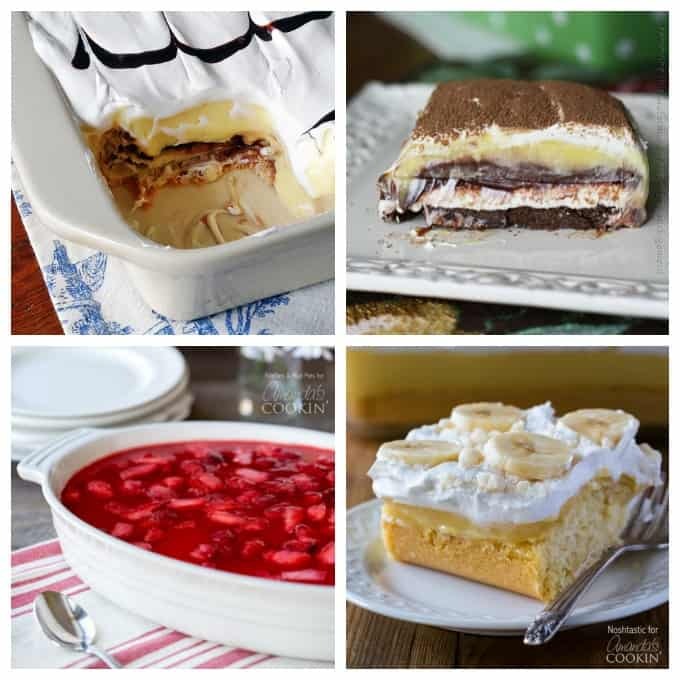 For other dessert lasagna recipes check out: Chocolate Peanut Butter Lasagna, Mint Chocolate Lasagna, Lemon Lush which can also be referred to as Lemon Lasagna! My aunt had a barbecue over the weekend and I jumped on the chance to test out this chocolate lasagna recipe. Oreos are great for no-bake recipes (see my Reese’s Peanut Butter Cup Oreo Bon Bons) and with all the flavors coming out lately, you could really switch up the direction of this no-bake dessert. But, gimme all the chocolate. 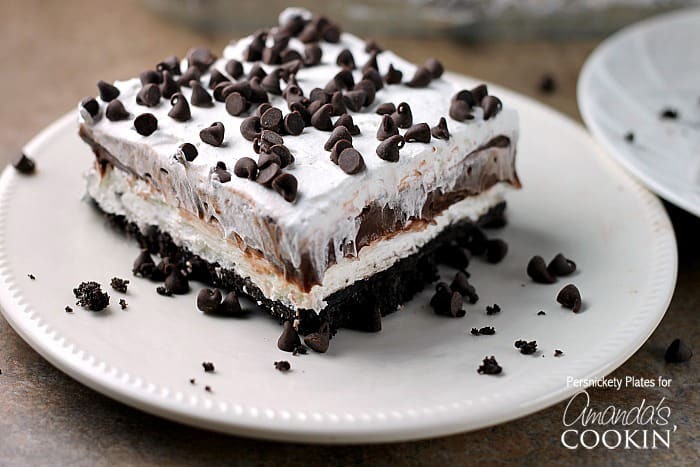 If you love chocolate then this is the layered dessert for you. It’s full of creamy, dreamy flavors and textures that make your taste buds happy. Because it’s layered into one pan, it’s the perfect take along for potlucks, parties and holidays. 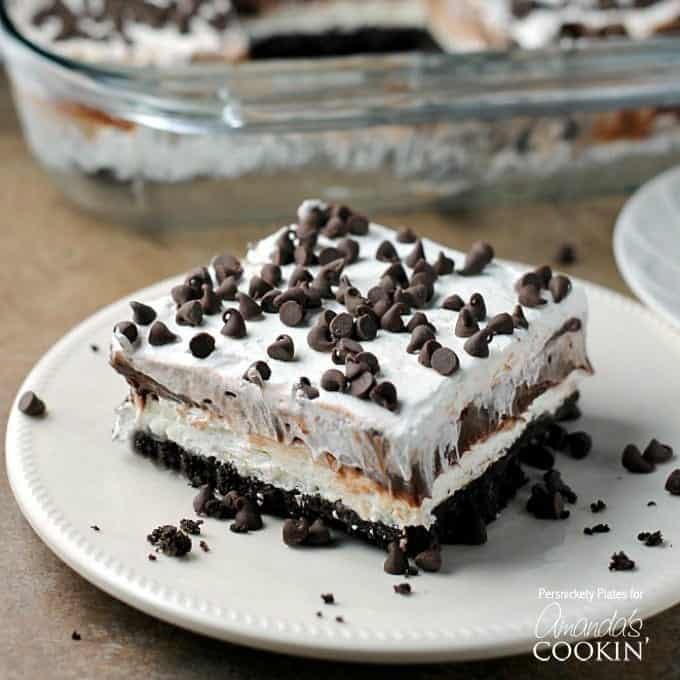 Since there’s no baking involved with this chocolate lasagna, you won’t have to heat up your kitchen making it perfect for warm months as well. See the fun mini chocolate chips on top? 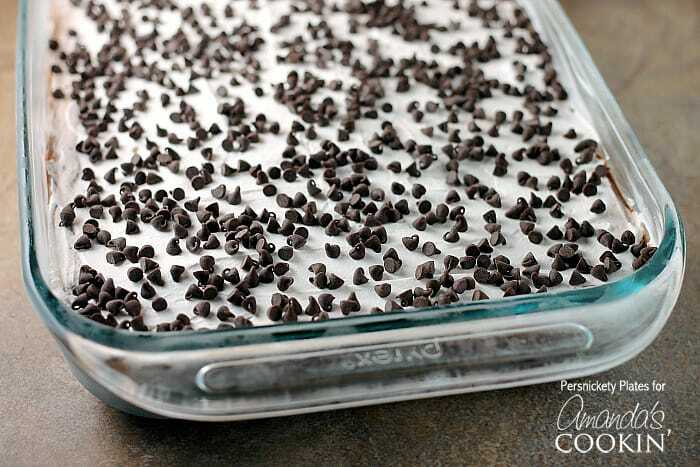 You can even change the feeling of this no-bake dream by substituting shaved chocolate for the chocolate chips. Use a vegetable peeler to shave a bar of bittersweet chocolate, creating short or long ribbons to sprinkle on top. Why bittersweet instead of semisweet or milk chocolate? You can certainly use whichever chocolate you prefer, but because there’s less sugar in a bittersweet bar, it simply shaves better creating prettier chocolate shavings for this chocolate lasagna. So while chocolate chips are fun for a barbecue or birthday party, you might want to try shaved chocolate for a holiday get together. 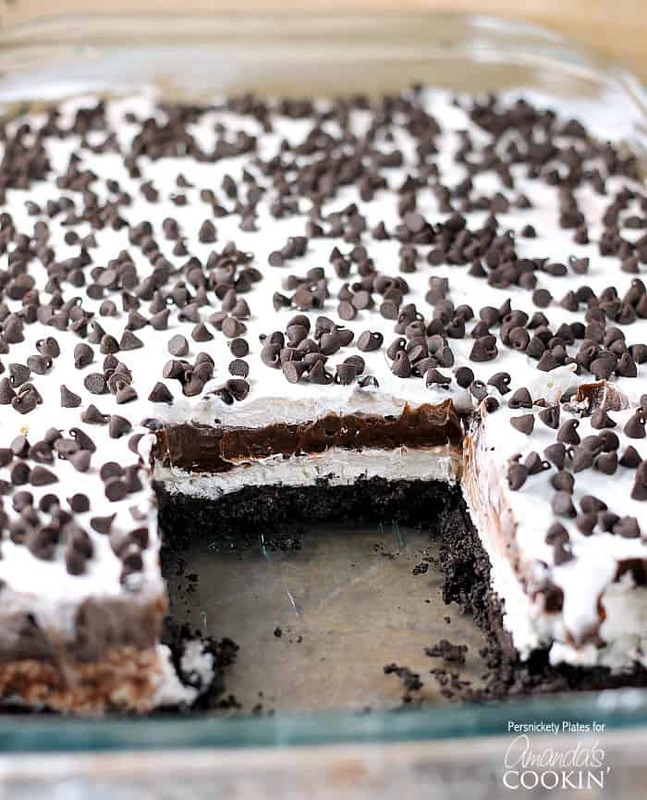 I have a confession, I don’t like Cool Whip BUT I decided to try this Chocolate Lasagna anyway, and it was delicious! It was a hit at the barbecue and with how easy it is to make, you won’t mind volunteering to bring it to your next get together. 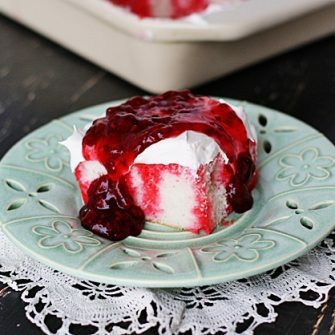 What holiday table or family barbecue would be complete without classic Ambrosia Salad! Or you can check out a collection of 30+ One Pan Dessert Recipes to find which suits you & your guests’ tastes! Hi! I’m Melissa and I blog over at Persnickety Plates. I love to cook and bake but I don’t like complicated recipes with hard to find ingredients. Most of what I make is quick and easy but delicious, of course. I live in Metro Detroit with my husband, our baby girl, and a pretty bad cat. When I’m not working, blogging, or being a mom, I like to work out to balance out the cookies I love to eat. Thanks Petra, so glad you loved it! Made it today. The cookie bottom was crumbly, didn’t Harden. Maybe I didn’t press it down firmly enough? Silly question…it says to Use a spatula to divide the Cool Whip in half and fold half into the cream cheese mixture. So it just means to use 1 of the 2 tubs and save the other for the topping, correct? I’m probably over thinking ? We don’t have mini chocolate chips where we live. What would be a good alternative? It’s just for garnish on the top. You can use a vegetable peeler to shave some chocolate curls off of a candy bar! as someone who cannot eat anything dairy can it be made with out cream cheese? I’ve got other ideas to use instead like soft serve ice cream or just more cool whip? You can find dairy-free cream cheese in the healthy food sections of grocery stores. OMG!!!! Do you people not read the article and directions?????? 3 1/4 is how one writes 3 cups and one quarter. Three quarter cups is written as 3/4. I believe you are correct… if it is 3 (1/4 cups). It should be 3/4 cups… it’s confusing… 3 1/4 cups is 3 cups and 1/4 cups. I used 3 1/4 cups of milk now it won’t setup ? Made this just for fun. It was a hit. It was requested for a birthday celebration. Easy to make and yummy! Yes should be totally fine for a couple days! Where it says “KITCHEN TOOLS YOU’LL FIND USEFUL” you have a 13″ x 9″ baking dish but in the instructions it says 9″ x 13″. May have been a typo but it’s 13 x 9 right? We don’t have cool whip here, is it ok to just use the cream cheese mix? You can make you own. It’s just whipped cream. I’m not sure where you are located or I could tell you what to use. Just do a google search for homemade whipped cream in your location. If you are in the US, use heavy whipping cream, beat in a mixer with a whisk attachment on medium high until stiff peaks form. is that regular sugar or powerd ??? I have the same question,a box of choco oreo cookie crumbs,what would be the equal to 36 cookies? I’m going to make this recipe today. It sounds so good!! But, I was wondering, my Oreos have frosting on them, does the frosting need to be removed? Do you use the whole cookie or do you scrape the filling off? Ok tried your recipe. Its awesome. The 2nd time i fixed it i use chocolate graham crackers and i like it both ways. Does the center of the cookie get crushed up with the cookie. Anything else I can use in the place of butter? Do you remove the frosting from the oreos before crushing them? I don’t see frosting specks in the crumbs. DO YOU REMOVE THE FROSTING FROM THE OREO COOKIES? What can I use instead of cream cheese? Hey, is there any option instead of using pudding mix? Something which I can easily use directly, as puddingg mix is not easily available where I stay! Excellent dessert. Made it for my husband tonight. It’s one of our favorites! So glad you liked it :) Thanks! Is 8oz of whip cream okay or should I get 16oz. Could not find 12oz. If you can’t find the 12-oz I would get the 16-oz and just use the remaining either on top of this dessert or with something else. Strawberries dipped in Cool Whip are great! I always use a 16 oz container. Half in the cream cheese and half on top. You can make it a few days before, but I don’t recommend freezing it. Does the coolwip have to be thawed before putting it on? If it is frozen, yes. Yes it will make it easier to spread. Excellent dessert! Thank you for sharing. I will be following other desserts of yours! Delicious! Thanks so much for such a great recipe. This recipe is an all time favorite in our house! The kids ask for it instead of cake for their birthday parties. ??. I just made this last night for a party and it was a HUGE hit!! Thanks for the great recipe! My mom makes this every time we go home to visit. It’s been my favourite since I was a teenager. When you crush the Oreos, do you remove the cream from the middle? Thanks! Could you use homemade whipping cream instead of cool whip? THIS IS AMAZING! My husband and I love it! Thanks for sharing! Tried this and ruined it by using 3 cups as directed…never got thick so turned into chocolate soup. Hi Gail. I’m sorry you had trouble, but it sounds like you may have only used one box of pudding? The recipe calls for 2 boxes, which is the right amount for 3 cups of milk. I also had chocolate soup, used 2 boxes of pudding and 3 and 1/4 cups milk…help!!? Did you use the Cook and Serve pudding? That tends to be the problem when it’s soupy. It needs to be the instant pudding. Well maybe you should have specified that instead of letting people (beginners who want to enjoy making new treats) know that instead of leaving it to guess work.. I didn’t even k ow there was a difference..
Hi Marianna. If you look at the post, it clearly states instant pudding. The boxes at the grocery store are also clearly marked as instant or cook and serve. There was no guess work needed for this recipe. Thank you so much Amanda. I’ll make it later for the party tomorrow ?. Yay, hope it turns out good for you!! 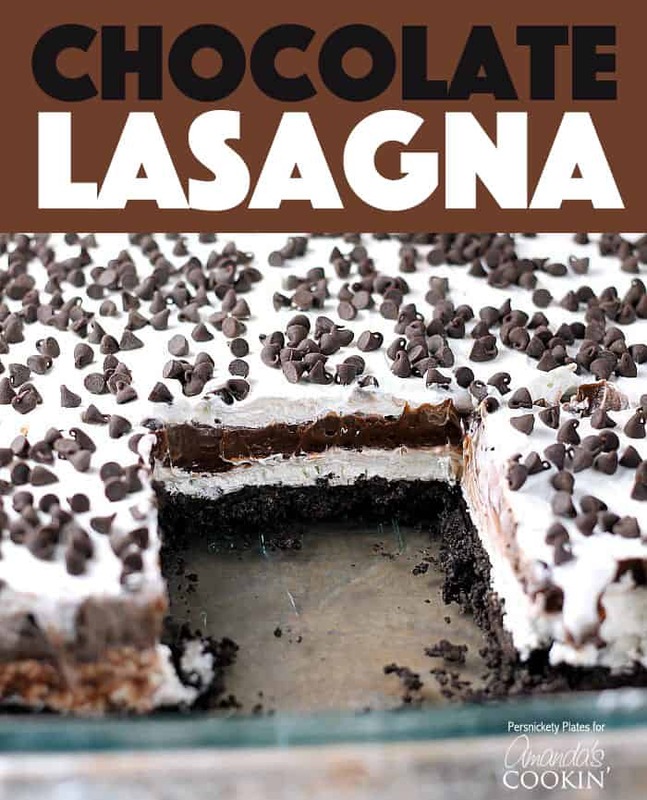 I have made your chocolate lasagna several times. My children, their children, nieces, nephews and friends LOVE it. Finally i’m asked to bring something other than the wine or soda. Will be trying the pot roast next. For us international readers, what is ‘cool whip’? We don’t have this product. Do you use both sides of cookies and scrap off the icing? Am assuming so but if you can reply today would appreciate it. This looks like a dessert dream.